Have you ever admired an unusual fuchsia tree in a friend’s garden, only to search in vain for a similar tree at the nursery? Have you seen a wisteria tree in full bloom at the botanical garden, and thought about how much more manageable this specimen looked than the overgrown serpent that has nearly toppled your pergola? These lollipop lookalikes aren’t some kind of rare introduction or a seldom-seen variety of your favorite flowers. These flowering trees are called standards, a tree form of many common plants, shrubs, and vines produced using specific pruning and training methods. You can grow a flowering standard for your landscape, and cultivate a small tree that will become a focal point in your garden. Many flowering plants are suitable to train as a standard. Depending on your soil, exposure, and climate you may consider training a standard rose, lilac, fuchsia, lantana, bougainvillea, wisteria, honeysuckle, or gardenia. Start with a young plant, and look for a specimen with a central, straight stem. 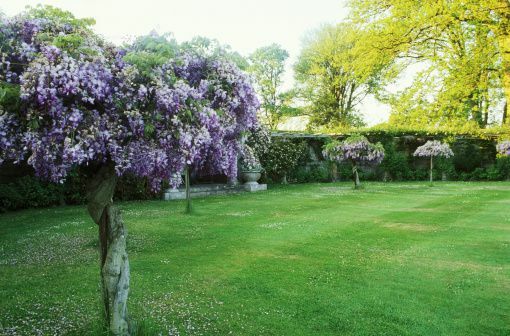 If you choose a slow growing plant, like a wisteria, you will have to wait longer for the final result than if you choose a fast growing plant, like fuchsia or bougainvillea. The first step in training your flowering standard is to focus on nurturing the whip. In botanical terms, the whip refers to the main shoot, from which all other branching shoots are pruned away. Take care not to damage the main shoot when removing side branches. Leave as many leaves intact as possible, to provide energy for the growing plant. When the whip reaches a height of six to eight inches, fasten this shoot to a slender piece of bamboo or another slender stake to encourage the stem to grow straight. The height of your flowering standard depends in part on the plant you are training, and where it will reside in your landscape. An eight-inch tall lilac standard might look silly and out of balance, but this height is acceptable in a fuchsia. Taller standards can also get wobbly, and may even be at risk of breaking if the whip is too thin or the conditions are windy. Perennial plants like roses, lilacs, and wisteria look pleasing with a height no greater than three feet. Miniature roses and annual flowers look balanced with a height limited to 24 inches or less. When your standard has reached the desired height, pinch off the top of the growing tip, which encourages side branches to develop. Remove any flower buds during this time of development to direct all of the plant’s energy into shoot formation. As each side shoot develops three sets of leaves, pinch the growing tip until the plant achieves a round shape. Provide abundant sunshine and appropriate flower fertilizer during this time of rapid growth. Expect the standard to look its best after two growing seasons. Whether in a container or in the ground, you should site your standard in a sheltered part of the garden. Keep the plant staked throughout its life, and upgrade to sturdier stakes as the plant and its crown mature. Prune the growing tips of the standard often to maintain the rounded shape. Fertilize the standard as you would the regular form of the plant; for example, rose fertilizer for rose standards or an acid-loving formula for gardenias. Overwintering standards is a challenge, even if the parent plant is normally winter hardy in your area. A greenhouse maintained just above freezing is an ideal place to overwinter tender standards, like fuchsias. Remove dropping leaves to prevent fungal diseases from developing. You can uproot standard roses and bury them in a shallow trench, or bring them into the greenhouse. Hardier plants like wisteria and lilac can remain outdoors if you protect the whip with plastic tubing and knock snow from the branches to prevent breakage. The worst sort of winterizing involves subjecting any standard to the warm air and weak light of the indoors, which encourages spindly growth.